Jeffrey Cirio rehearses with members of Cirio Collective. Photo by Jordan Jennings. The Joyce Theater regularly presents a summer ballet festival, showcasing the best of chamber-sized companies. Choreography ranges widely, utilizing everything from socks to pointe shoes, but this year three of the five groups have something in common: Gemma Bond Dance, Cirio Collective and Claudia Schreier and Company are all making their Joyce debuts. Catch them, along with Amy Seiwert's Imagery and Emery LeCrone DANCE, July 18–29. The Joyce Theater regularly presents a summer ballet festival, showcasing the best of chamber-sized companies. Choreography ranges widely, utilizing everything from socks to pointe shoes, but this year three of the five groups have something in common: Gemma Bond Dance, Cirio Collective and Claudia Schreier and Company are all making their Joyce debuts. Catch them, along with Amy Seiwert's Imagery and Emery LeCrone DANCE, July 18–29. 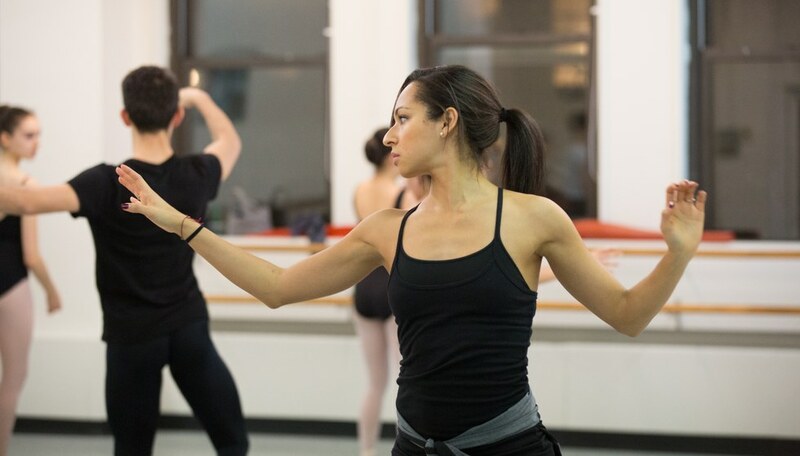 American Ballet Theatre corps member Gemma Bond presented a full evening of work at Danspace project in February 2016, and Atlanta Ballet commissioned her Denouement in March 2017. Now, she's reveling in the freedom of an open-ended Joyce creation. "I want to show exactly where I'm going and what I'm doing with my work," she says. Past performances have revealed Bond's ability to craft serene, graceful pas de deux as well as a knack for coaching larger groups. Alongside the Joyce premiere, she plans to present two ballets: The Giving, a duet created through a grant from the New York Choroegraphic Institute, and an older group piece called Then and Again. American Ballet Theatre principal Jeffrey Cirio's company, Cirio Collective, makes its first New York City appearance when the dancers step onstage at the Joyce. "It means so much to be recognized as a choreographer in New York," Cirio says. "We imagined being at the Joyce 5 or 10 years down the road." He plans to bring back two older works (one of his own and one by Boston Ballet principal Paulo Arrais) alongside a premiere by contemporary choreographer Gregory Dolbashian, whose hip-hop–inflected movement pushes the limits of "ballet." Cirio will create a trio, inspired by the idea of being in multiple places—fitting for a choreographer whose dancers hail from New York City, Boston, Kansas City, Oslo and elsewhere. Claudia Schreier in rehearsal.Photo by Rosalie O'Connor. Independent choreographer Claudia Schreier wrapped up her fellowship at New York University's Center for Ballet and the Arts in May 2016—perfect timing for the next steps in her career. "My fellowship showing was a work-in-progress of what will premiere at the Joyce," she says. Schreier will present five pieces in total— including Charge and Solitaire—performed by members of New York City Ballet and Dance Theatre of Harlem, plus other dancers. "I love that I can be in concert with fellow artists who ascribe to the 'ballet' title," she says, reflecting on the festival's variety. "It doesn't have to box us in."